Peter Wirth says the new A-Class presents a huge opportunity to showcase the attainability of several Mercedes models. Since opening its doors roughly 16 months ago, Peter Wirth says, Mercedes-Benz of Springfield has met or exceeded most all of its stated goals and expectations. Indeed, if it is lagging in any aspect of its multi-faceted operation, it is in the broad realm of educating customers across its broad service area that a Mercedes is affordable — or ‘attainable,’ the word he and the industry prefer to use. It’s not from lack of trying, he said, before adding quickly that the company will try even harder, but probably more a function of the fact that there hadn’t been a Mercedes dealership in the 413 area for a full decade before this one opened on the site of the old Schine Inn just off Route 291 in Chicopee. And this helps explain why residents of this area might not be as enlightened as those in other markets when it comes to the fact that ‘Mercedes’ and ‘affordable’ can co-exist in the same sentence. “We missed out on all that communication, getting the cars into the marketplace, talking about them, and showing them,” he said of that 10-year hiatus, during which the carmaker greatly expanded and diversified its lineup. But Mercedes now has an additional arrow in this quiver of attainability and another intriguing talking point, he said, with the introduction of the A-Class, which will begin rolling into showrooms, including the one in Chicopee, next month. It joins the CLA, introduced several years ago, and the GLA model SUV as Mercedes models that start at under $40,000, and Wirth expects it to be a significant addition to the portfolio. That’s because the A-Class is about more than affordability, he told BusinessWest. It’s also about technology and a leap from traditional luxury to what Mercedes is calling ‘modern luxury,’ meaning features like MBUX. That stands for Mercedes-Benz User Experience, which the carmaker, and Wirth, tout as the next generation of user-friendly technology. The MBUX user interface allows the driver to use voice commands to control everything from the radio station and the volume level to the temperature in the cabin. The A-Class is equipped with MBUX, hailed as the next generation of user-friendly technology. 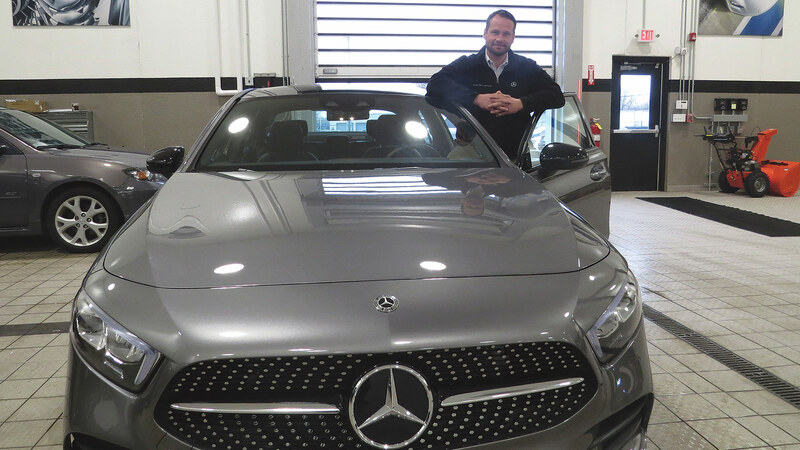 Wirth gave similar commands as he gave a demonstration of the first A-Class to arrive at his dealership. Starting each conversation — because that’s what these are — with ‘hey, Mercedes,’ he proceeded to turn the heat up by merely saying ‘I’m cold,’ receive directions to a downtown Springfield business, and get a rundown on the restaurants within a mile’s radius of the dealership. Meanwhile, the dashboard instrumentation can be changed electronically to display anything the driver wants, from the odometer and tachometer to things like speed limit and the range the car can go on the amount of gas left in the tank. As for the affordability factor, the A-Class has a base sticker price of $32,000 (which includes a considerable amount of standard equipment, including a sunroof and the user interface), and most will price out at under $40,000. That’s a number that wouldn’t surprise most people in other markets, who have had a Mercedes dealership to visit through this decade and have become aware of several models that fall into the ‘affordable’ category. But it might still surprise many in this region. And with that, Wirth revisited another Super Bowl commercial, the one for the CLA model, which debuted at $29,000. It was a spot that turned some heads and put a Mercedes in driveways where one had never been. “That was a big bang — that was eye-opening for many people,” he said, adding that the CLA, which remains popular, would go on to secure what’s known in the business as a ‘high conquest rate,’ meaning that people were opting out of the cars they were driving and into the new Mercedes model. This is significant, he said, because, conversely, Mercedes has one of the highest loyalty rates within the industry, meaning that once they own or lease one, the Mercedes customer is very likely to go back for another. 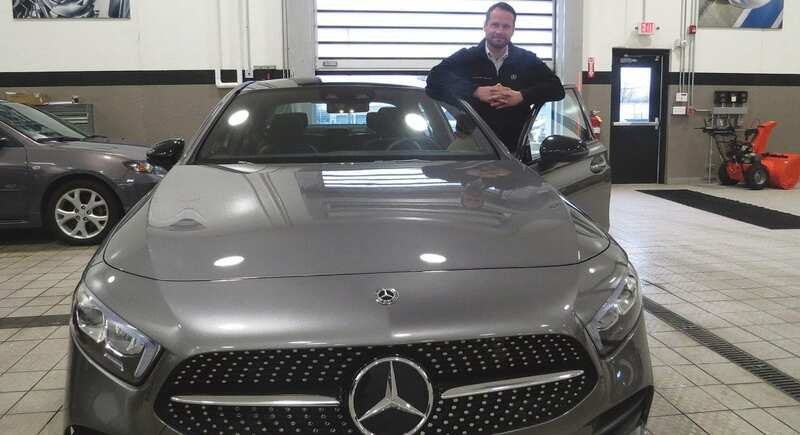 The company is hoping for a similarly high conquest rate with the A-Class, which can turn heads not just with its styling and price tag, but also the user-friendly technology. If they’re right, more people will be saying ‘hey, Mercedes,’ before and after they get in the car.